Today's run = not so great. I felt like my entire upper body was hit with a Mack truck and the wind was knocked out of me. Perhaps the 8 miler was the culprit? Either way, I only went a little over 2 miles and actually walked some of it (which I hate to do). However, I made up for it with an intense lifting session with Travis and Jeff. Bench, deadlifts, powerlifts, punching bag. Oh boy, I feel like even typing is work right now! Talked to my Uncle Doug about the Cape Cod trip Trav and I are taking at the end of next month. It would be cool to run a race with Doug while we're over there, but there's nothing scheduled. Bummah! He said he'd run with me at 5:30am, so we'll see how that goes! 2:30am Seattle time??? Say what?! It should be a fun trip. Congrats! 9 min miles is awesome!!! Speedy girl! I don't know how you run in the rain... hate it! I hate to walk, too. Good job on the 8! Rooster wake up call this morning Zoe? I think I saw your tweet this a.m. Did you find that little dude? 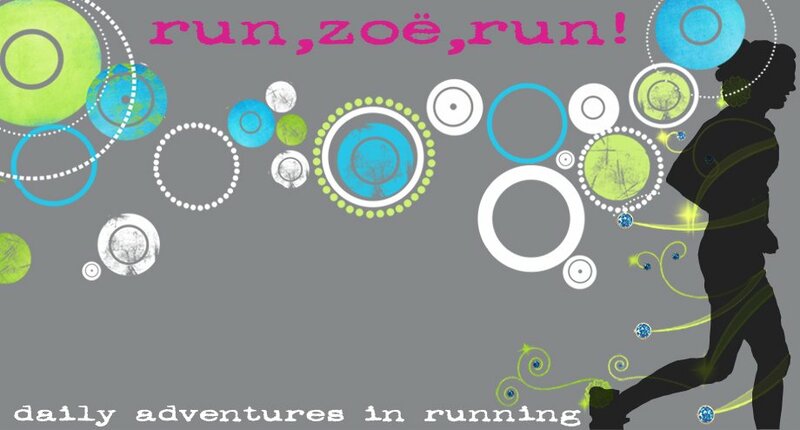 Run Zoe Run. I haven't gotten my run in yet. Time to go now. nice job on the 8-miler! i wouldn't be surprised if you were feeling a little tired the next day because of it. at least you got out for some more miles!